WHEN TRAIN climbed to the top of the charts with the single DROPS OF JUPITER, nothing could have prepared the band for what was to come. Released in May, 2001, the song's epic chorus and lush orchestration saw it reach the top position around the globe including in their homeland of North America and here in Australia. By June, Drops of Jupiter was cert ied platinum and the single spent 53 weeks on the US Hot 100 chart and went on to win a GRAMMY award for Best Rock Song. Such success was destined to have an effect on the band and it not only saw Train head out on an international tour but also discover a variety of themes for its follow-up album, MY PRIVATE NATION. Train singer-songwriter PAT MONAHAN said the success of Drops of Jupiter saw the band place pressure on itself for the follow-up. ``There was pressure to follow up the last album and I think that is because the bulk of the pressure came from ourselves,'' Monahan said. ``We know that a lot of bands come and go but it's a place where we'd like to stay. So it took a lot of work to try to make the record what we thought needed to be made.
'' Monahan said such pressure saw the band re- write and re-record material on numerous occasions before it felt co ident enough to complete the album. ``We kind of finished the album a few times. We would write and record and then listen for a while and then go back and do writing and recording again. ``I think it was about three stages of that until we decided that we were done.
'' In comparison to the last album, My Private Nation explores the issues of fame and the band's subsequent growth. ``I think fame affected my songwriting but I think it definitely had a great affect on everything. ``The whole idea of My Private Nation is kind of based on the idea that I think we're the kind of band that not everybody gets. ``I think every band is like that, not everyone is going to love it. ``But My Private Nation is kind of like a way to define the band as its own island but to also offer for everybody to come and visit.
'' D ficulties with the album may have been overcome but the band faced another barrier when long-time bassist CHARLIE COLIN left the group in September. Set to head out on a major tour of the US, Colin's departure could have spelled the start of trouble for the band and its fans. But Colin has since been replaced by JOHNNY COLT, a former member of THE BLACK CROWES. ``It was probably about two months ago that he left and now we have Johnny Colt on board and it's better than ever. ``We've only had one tour since he's been with us and we did that whole tour and that's probably why it was such a great, fun tour for us, all the baggage was gone. ``We could just get down to music instead.
'' Train was formed in 1994 by Monahan and ROB HOTCHKISS, who also left the band earlier this year, with SCOTT UNDERWOOD on drums. In 1996 the band went to New York City to play a showcase date for COLUMBIA RECORDS but was turned down by the label. Incidentally, Train was signed to the label a year later when it released its debut album. Train will return to Australia to support LIVE on a national tour which will arrive at NEWCASTLE ENTERTAINMENT CENTRE on December 9. 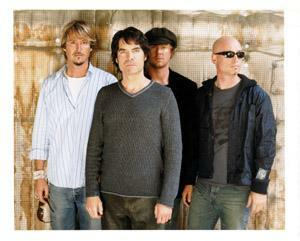 Tickets to Live supported by Train are available from TICKETEK on 4921-2121.